The NEO Demo is a Multi-Agent, Multi-Agent System (MAS) demonstration of agent technology in a Noncombatant Evacuation Operation (NEO). NEO illustrates the interaction of agent teams in aiding human teams to cooperatively plan and execute a hypothetical evacuation of US civilians from a Middle Eastern city in an escalating terrorism crisis. In NEO, RETSINA and Open Agent Architecture (OAA) agent teams and systems cooperate with each other and their human counterparts to evaluate a crisis situation, form an evacuation plan, follow an evolving context, monitor activity, and dynamically re-plan. NEO demonstrates the interoperability and use of two disparate agent systems' teams for aiding humans (officers and Ambassador) to effectively monitor the scenario, retrieve and fuse information for immediate use, and to plan and re-plan an emergency evacuation. In NEO, a team of agents cooperates to effectively aid a human team. Each team member is represented and aided by a dual task and information agent, known as the Messenger Agent. Humans communicate with the system through their interface agents, which can be activated through VoiceAgents and other means of input. VoiceAgents eavesdrop on human team members’ conversations and take action based on the input of commanders and people in the field. Information is presented on various platforms and displays, and in multiple formats. · When an officer mentions the need for flight information for evacuating US civilians from Kuwait City, the oaaflight agent responds. The oaaflight agent returns to the Messengers a schedule of departing flights from Kuwait International Airport. · In response to the VoiceAgent's activation by a commander's mention of the need for weather information, the RETSINA WeatherAgent returns weather information for Kuwait City, and displays it graphically, using a web browser, and/or as text alone. · When the need for a route to the airport is mentioned, the RPA is queried. Given its access to a multi-modal map and knowledge of other contingencies, the RPA plans a route to the airport. It sends this plan to the Messengers, which then display a multi-modal map with a planned evacuation route. · Through an OAA Phone agent, a source in the field informs the system that the environment has changed: a roadblock interferes with the originally planned route to the airport. This information is propagated from the VoiceAgent to the Messenger, which passes the message along to the RPA. The RPA returns a revised route to the team members through their Messengers. · The Visual Recognition Agent (VisRec) discerns that a bomb has exploded at the airport. It notifies all Messenger Agents. Given this new information, the Ambassador calls for a rendezvous at OKAS, the military airport. The VoiceAgent is activated, the Messenger receives the message and sends it to the RPA, and the RPA plans and distributes another route. · The Air Officer calls for an airlift at OKAS. CAMPS gets activated and a map of the airlift is displayed. The Messengers display the airlift schedule. In NEO, we demonstrate interoperability of two disparate MASs, by use of agents in two agent systems, the RETSINA architecture, and the Open Agent Architecture (OAA). The use of our InterOperator acts as a two-way translation and messaging agent, allowing agents of both systems to communicate. In CoABS NEO, the RETSINA Messenger queries agents from both the RETSINA architecture, and, through the InterOperator, agents from the OAA MAS. The InterOperator translates messages for OAA communication, and passes translated requests to the Facilitator, the middle agent within OAA. The Facilitator then sends messages, based on its own matching criteria, to the appropriate agents within OAA, and, if the needed service is available and has the requested information, receives its information. The Facilitator forwards the reply to the InterOperator, which then retranslates the messages for RETSINA, and forwards these replies to the RETSINA Messengers. NEO demonstrates substitutability of agent sources from two different agent architectures on a dynamic basis, while also bridging different Agent Communication Languages (ACLs)--with the use of the InterOperator. When a requested service is unavailable in RETSINA, for instance, the Messengers will query the Matchmaker for other agents capable of the task. The Matchmaker stores the capabilities from both the RETSINA and OAA MASs, and forwards these to the Messenger, which then queries the available agents. When the capable agent(s) reside in OAA, the Messenger will query the InterOperator, which represents the OAA agents to RETSINA, and translates the request into the OAA ACL. Alternatively, when a requested service is unavailable in OAA, the Matchmaker will return a capable agent residing in RETSINA. NEO shows the reusability of agents from other agent-system contexts. 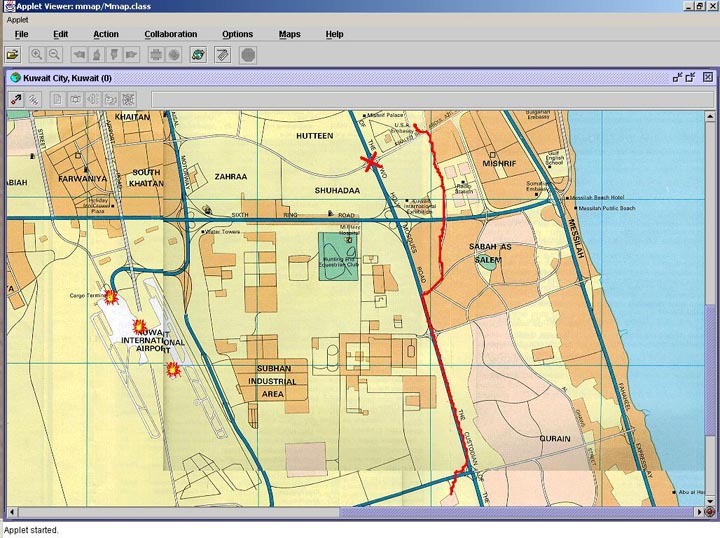 The Route Planning Agent (RPA), for example, which was developed for running tests on human-agent teamwork interaction, is used in this demo for planning an evacuation route, as well as in CoABS TIE1 for helicopter flight path planning. The VisRec agent was developed for other contexts and reused here. Messengers were first developed for MURI JoCCASTA, and are reused here. And finally, the Matchmaker is used in multiple agent contexts. NEO also demonstrates the "agentification" and reuse of legacy systems within an agent architecture (CAMPS). Developed over many years by BNN, it is agentified and reused in the CoABS NEO demo. For more information on MAS interoperability, see J. Giampapa, M. Paolucci, and K. Sycara, "Agent Interoperation Across Multiagent System Boundaries," in Proceedings of Agents 2000, Barcelona, Spain, June 3-7, 2000.